March is a month that can be filled with chilly temperatures and cold winds or warmer days and bluer skies, but no matter what Mother Nature brings, March, for the past 38 years, has also been National Nutrition Month. Originally a way to promote the profession of Dietetics/ Nutrition as well as “serve as a vehicle for delivering nutrition education messages to the public,” March is also a time where we can renew our commitment to good health via the food we eat. The quest to eat right can at times feel like a game whose rules are always changing, however, one thing that has held true for the past twenty-five years is the Nutrition Facts Label on our food. But 2014 saw the proposal of some significant alterations to that label. 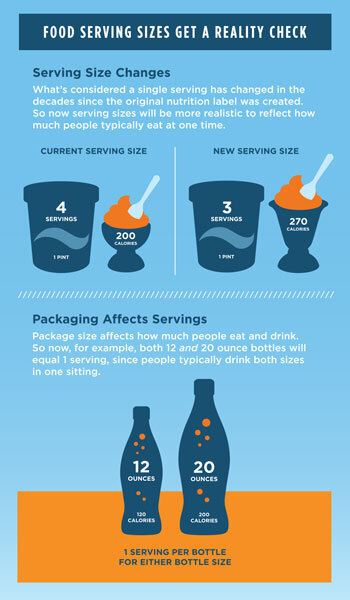 Since the approval of those changes, the design, the information stated, and the serving sizes have undergone a makeover. The new food label now provides a better way for you to renew your commitment to good health via good nutrition by giving you important information to help make educated decisions. · Increased font size for calories, servings/container and serving sizes and bold font for number of calories and serving sizes to draw more attention to those important points. · Declare the exact amount of Vitamin D, Calcium, Iron, and Magnesium - as those nutrients have been found to be deficient in many American diets. Others nutrients can be added, but are not required. · “Added Sugars” have been included under the carbohydrate section. This will reflect not the amount of sugar that naturally occurs in the food (for example the kind that exists in milk, fruit and grains) but rather how much the food manufacturer has added to make the food sweeter or to cut the acidity. It is very hard to eat a healthful diet and not take into account the amount of added sugar in the diet. Ideally it should be less than 24 g/day. · “Calories from fat” has been taken off as it has become obvious that the type of fat is more important than the amount of fat consumed. · Daily values for Sodium, Dietary Fiber and Vitamin D are being updated as new research reflects changes in the total value needed for a healthy diet. · Serving sizes for many foods will change to more closely reflect the actual amount of food consumers are eating rather than how much they “should” be eating. This improved information is a powerful tool to help us in our commitment to eating a more healthful diet. The new food label reflects significant strides on the part of nutrition professionals in helping our community achieve their goals. Whatever Mother Nature brings this March remember there is no such thing as bad weather only bad clothing. A similar “go get ‘em” attitude coupled with an educated approach to reading your food labels will help you reaffirm your nutrition goals will help you reaffirm your nutrition goals. By Theresa Bindig, MS., RDN.